THANKS TO ALL DONORS. WE MET OUR GOAL! A big THANK-YOU to each and every one of the 41 donors who gave to our Impact Vine donation site to raise the last $5,000 for our new website. We met the goal of raising $2,500, which Robin Tauck and The TRIP Foundation will match to give us the $5,000 we need to finish up. We will be loading the new site with members' profiles and events during August, for a launch in September. HEAR PODCAST OF "SAVE FREEMAN HOUSES"
If you didn’t hear our WPKN interview show last Monday, catch it now at: bit.ly/soundcloud_freeman. Hear Maisa Tisdale (Mary & Eliza Freeman Center) talk about the implications of the 1848 Freeman Houses being placed on the National Trust's list of 11 Most Endangered Historic Places in America, Wes Haynes on the CT Trust's role in that, and Laurie Heiss (the founding executive director of the Merritt Parkway Conservancy) on what the impact on the Merritt Parkway was of being placed on that “Most Endangered List” in 2010. 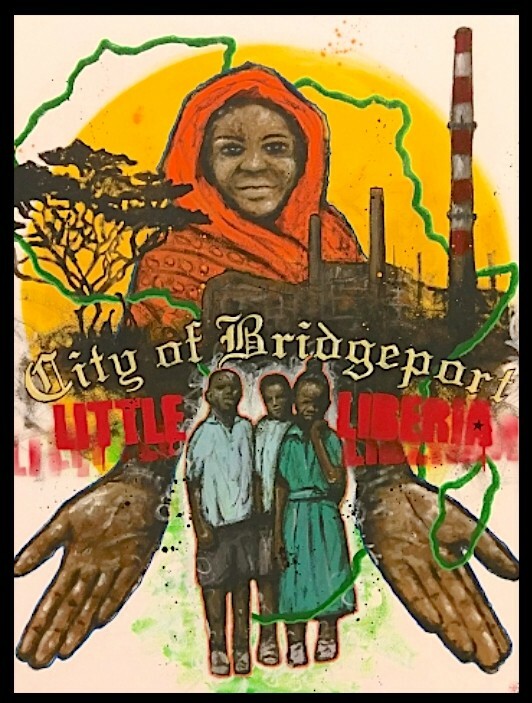 Jahmane, one of the artists working with Maisa to tell some of the stories of the Freeman Houses and “Little Liberia” to a contemporary audience in visual terms, talks about the team effort that he has curated to bring these stories to the fore in order to stimulate the realization of the critical importance of these houses for Bridgeport’s history, African American history and for the future economic and community development of this part of Bridgeport’s historic South End. 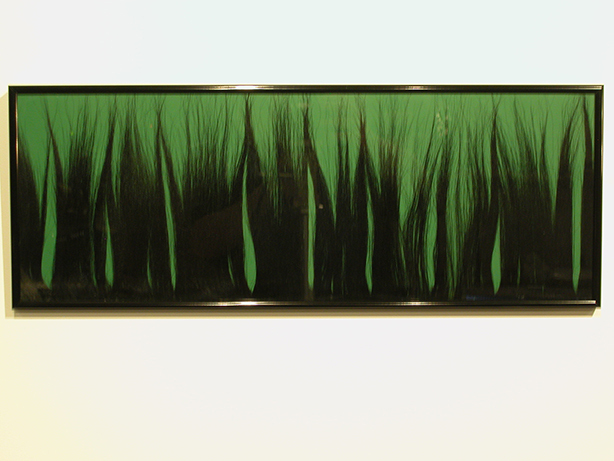 At right, Jahmane's Unforeseen Legacy (2018, acrylic on panel, 48x36; click for larger image). Save the Date of August 1, 6-9pm, for an evening of Portuguese cuisine and seafood at Dolphin's Cove Restaurant and Marina, as the next in the series of SavorCity visits to the culinary hidden gems of the most diverse city in Connecticut. Keep an eye out for signing up for this visit to Dolphin's Cove Restaurant & Marina at 421 Seaview Ave. on Bridgeport's East End shoreline, where the Matias family have been serving seafood and Portuguese favorites since 1993.
at Blends Gallery, 1163 Main Street, Bridgeport, on Sat. July 14, 7-11pm. (Admission is $10; $5 before 8pm). If you're attending, you're asked to consider wearing black/white formal/semiformal attire, preferably referencing the 1940s, or any other particular era. Nancy Breakstone (Booth 88), Sue Brown Gordon (37), Amy Kaplan (106), Dorothy Robertshaw and SPAG Studios (112-13) are included among the 160 international artists with work in the Westport Fine Arts Festival, organized by the Westport Downtown Merchants Association this Sat and Sun, July 14-15, 10am-5pm. Wander down Main Street including around Bedford Square by way of Elm Street and Church Lane. Valerie Ahneman, and friends, entertained more than 100 people at a double celebration of the French and American Independence days, Sunday July 8, at the Hotel Watson on 57th Street in New York. She writes: "From Big Band to Jazz Ensemble to R&B to pop, we covered it all with an 8-piece band and 6 singers." Karla Bernstein has two composited photographic images, Creation (detail at right) and Escape, from her One Night I Dreamed… project chosen for the juried show Metamorphosis, showing from July 22 thru Sept 2, 2018, at DarkRoom Gallery, Essex Junction, Vermont. Karla's entire project can be viewed at: www.karlabernsteinphotography.zenfolio.com. 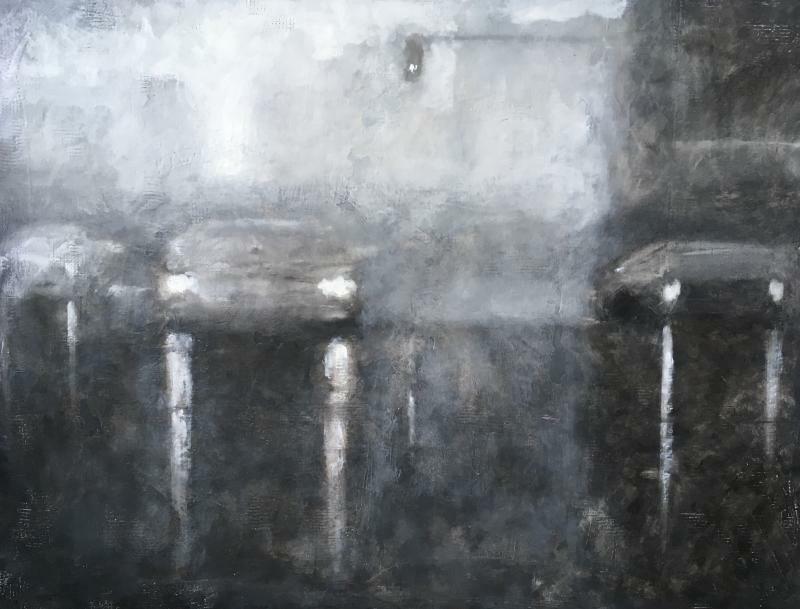 Suzanne Benton has a solo show, From Paintings in Proust, at Bistro du Soleil, 615 Riverside Ave., Westport (just by the railroad station), opening with a reception Sun. July 15, 4-7pm, and running through Aug. 11. At right, detail of Suzanne's Focus (monoprint with Chine collé, 27x20). Suzanne's work is "rich with original re-castings of mythic, biblical, literary and art historical sources, as well as oral tales and multicultural images she has gathered on her working journeys" (Gloria Orenstein). Here, see work from her two-year odyssey traveling, studying and then creating art in response to the 200+ paintings and painters that Marcel Proust references in his In Search of Lost Time. Nancy Breakstone, will be showing her photographs in booth #24 at the Westport Fine Arts Festival, organized by the Westport Downtown Merchants Association this Sat and Sun, July 14-15, 10am-5pm, all along Main Street. In addition, her photograph Field in the Sand (30x30, detail at right) has been accepted into the Summer Breeze Annual Open Members Show, of the Blue Door Art Center in Yonkers, NY, opening with a reception Sat. July 21, 6:00-8:30pm. Ken Delmar has a solo show of a selection of his oil paintings and water colors, Yesterday and Today, at The Mayor's Gallery of Stamford through Sept. 7. There will be a closing reception on Thurs. Sept. 6, 5:30 – 7:30pm. 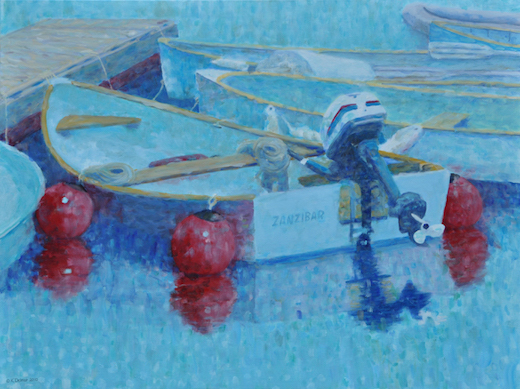 At right, Ken's Zanzibar (2010, oil on linen, 30x40, detail), a scene from a dock in Rowayton, on the Five Mile River. Ken more typically paints seascapes from Maine or California, but this was an inspiration. 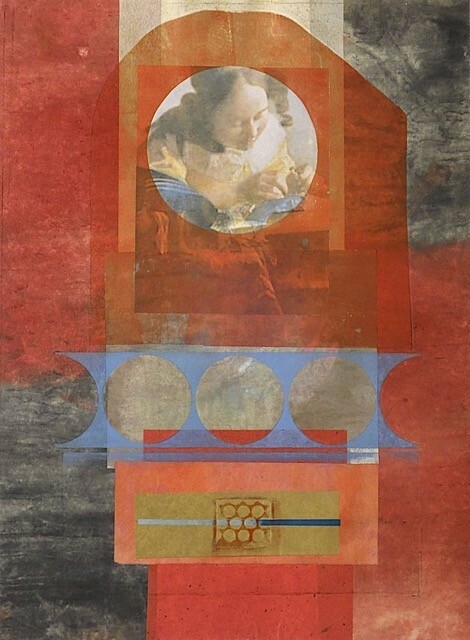 Karen Neems will be showing work, including her most recent series, in RECONSTRUCTIONS, a 3-person show at the Bruce S. Kershner Gallery, at the Fairfield Public Library, opening Sat. July 21 and running through Sept. 15. 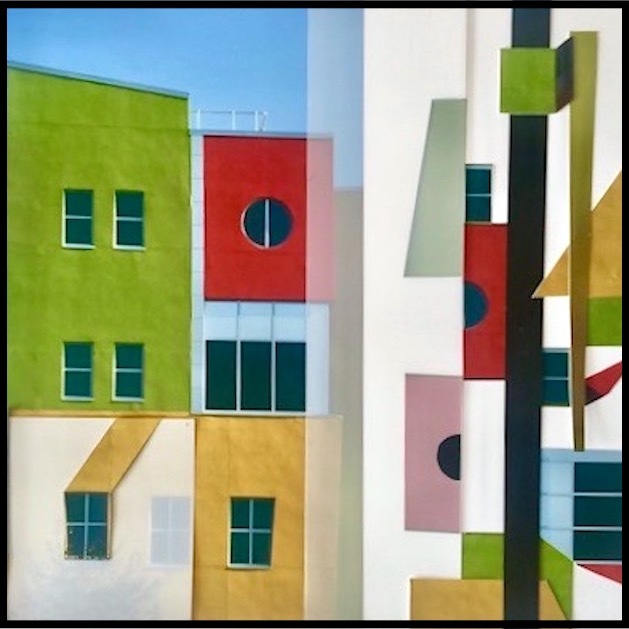 At right is Karen's Facade (2017, mixed media and photo collage, 18x18; click for larger image). Her most recent series, Deconstructions, explores the synergy that results from the juxtaposition of a photograph and its deconstructed parts. 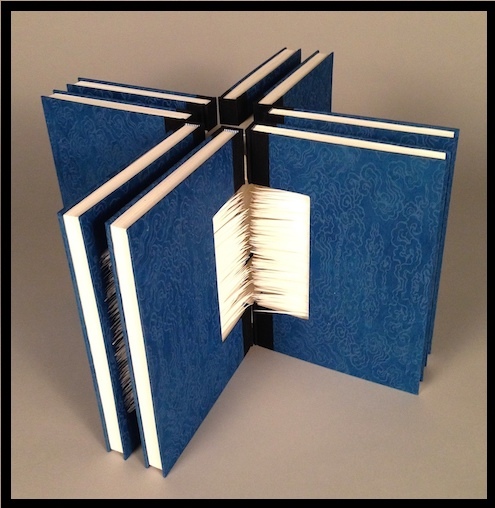 Chris Perry currently has his book art in two shows across the country. 181 Ripples: spigot (2018) is included in Bibliophoria at Sebastopol Arts Center, Sebastopol, CA, through July 29. Then 147 Ripples: vortex (at right; click for larger image) and 144 Ripples: mill, are both featured in The Spirit of the American Home at The Gallery at Onatru, Lewisboro, NY, through July 20. Adelka Polak and her Sova Theatre received their first film credit - in Michael's Mayer's film, The Seagull, based on Chekhov's play, featuring Saoirse Ronan, Elisabeth Moss, Annette Bening, Brian Dennehy among others. Adelka Polak coached the actors on-site in learning how to use the shadow puppets that were created by Liz Popiel. Dorothy Robertshaw has several pieces in the 45th Westport Fine Arts Festival this Sat and Sun July 14 and 15, 10am-5pm. At right, her Early Spring (2018, encaustic nature-inspired collage, 12x12). Dorothy is also working on a series of eight paintings that she will be donating to Covenant House, New York. Lisa Seidenberg has her short film "Letter From Mom" included in Wish You Were Here, an exhibition at New Haven's The Institute Library (847 Chapel St.) that runs through Aug. 31, 2018. In the two-minute film, a crumpled aero-gram letter from the filmmaker's mother in decades past is illustrated using found footage home movies. A poignant, sometimes funny and nostalgic piece. Click image for video. Elizabeth White has her work Foliation (2018, hair on paper, 9x24, detail at right; click for complete image) in Collaborative Concepts 2D, an exhibition that is a contemporary mix of abstraction and line, curated by Barbara Galazzo, and opening at Hudson Beach Glass Gallery at 162 Main Street, Beacon, N.Y. with a reception Sat. July 14th, 6-9pm, running through August 5th. 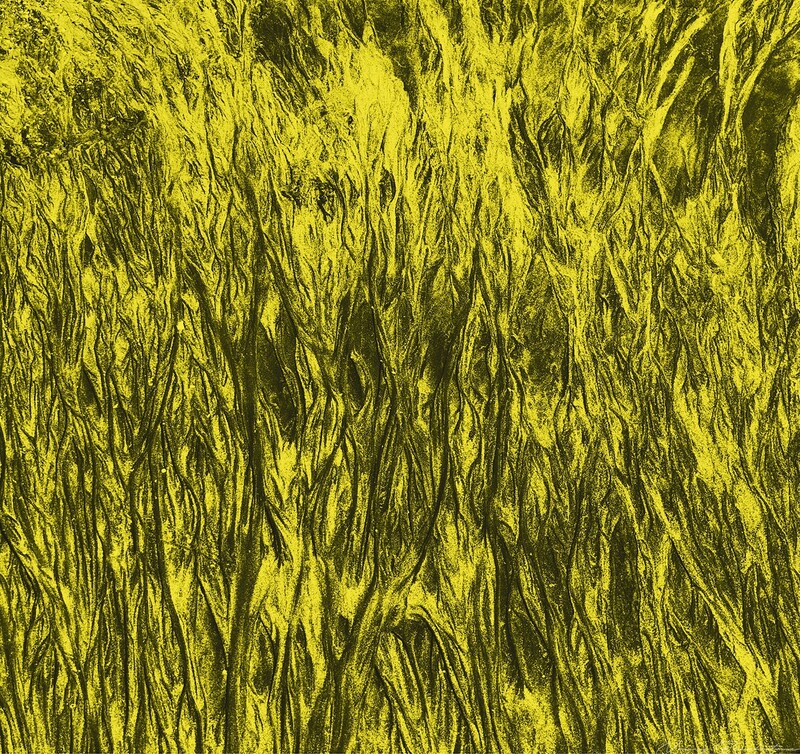 In the show, each has used line to tell a story and, in this piece, Elizabeth uses line, through human hair mimicking tall grasses near a pond. Impressionist artist and master instructor Dmitri Wright will be offering a free "Sunset to Moonlight" Impressionist Painting workshop at Weir Farm National Historic Site on Sat. July 28 (repeated again in September). Featuring plein air painting during the latter part of the day and early part of the night, the workshop will consist of a lecture and demonstration by Dmitri on how to capture inspired moments between sunset and moonrise from an impressionist's perspective. Participants should bring their own supplies, have a basic under-standing of their selected art form, and must be able to handle their own equipment for plein air fieldwork as well as for the studio workshop environment. Sun. July 15: Suzanne Benton, From Paintings in Proust. Bistro du Soleil, 615 Riverside Ave., Westport. Opening Reception, 4-7pm. Sat. July 28: Dmitri Wright: Weir Farm National Historic Site, Free "Sunset to Moonlight" Impressionist Painting workshop. This fall’s election of a new governor in Connecticut brings with it hope and opportunity. Over the next several months, the candidates will openly discuss the strengths and challenges of the state and debate their priorities and vision for the next decade and beyond. The Cultural Alliance is a Co-Sponsor for Create the Vote, with CT Arts Alliance and the CT Alliance for Arts Education, to ensure that a thriving arts, culture, and creative sector is part of that discussion and one of the priorities for our next governor. One of the highlights of the Create the Vote campaign is the upcoming Forum on Arts, Culture & the Future of CT’s Economy, where the candidates for governor will discuss the issues of the creative community. The event is on July 31 from 5-6:30 at The State House in New Haven, at 294 State Street - with networking, music and drinks from 4 to 5pm. We encourage you to attend and participate in the Forum to hear firsthand where the candidates stand on the issues of arts, culture and creativity. REGISTER HERE. Candidates Attending: Joseph Ganim, Oz Griebel, Rod Hanscomb, Ned Lamont, Marisa Manley, David Stemerman, Tim Herbst. Candidates Invited: Mark Boughton, Steve Obsitnik, Cameron Scott, Bob Stefanowski, Micah Welintukonis. The questions asked of the candidates will be based on the Create The Vote CT candidate questionnaire. The U.S. Department of Arts and Culture (USDAC) is "a people-powered department—a grassroots action network inciting creativity and social imagination to shape a culture of empathy, equity, and belonging. USDAC invites everyone to perform a future shaped by the transformative power of arts and culture." Recently, USDAC launched its free, downloadable guide, Art & Well-Being: Toward A Culture of Health, providing information, case studies, examples, ethical guidance, and links to inspiring work in the U.S. and abroad to promote a culture of health. The guide asks you to “Envision a time when cultural interventions to improve personal and social health are commonplace and well-funded....Imagine never again having to argue for the necessity of beauty, connection, and purpose to well-being. Imagine the scales falling from policymakers’ eyes, allowing them to finally see that social justice heals. 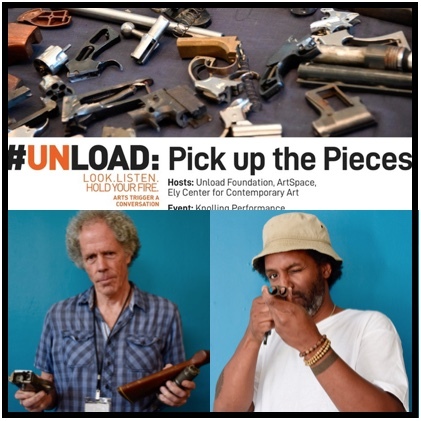 Imagine them investing real power and resources in that truth.” To bring this vision closer to reality, USDAC has organized a webinar, a free online Citizen Artist Salon: Art & Well Being: Toward a Culture of Health. for July 25, 6-7:30pm. Featured Guests include: John Govea, Program Director for Immigrant Rights and Integration, Evelyn & Walter Haas Jr. Fund; Marina Tsaplina, Founder and Creative Director, THE BETES; and Veena Vasista, Wake Up Artist and Movement Maker, London, Chicago, Santa Fe. The salon will be moderated by Arlene Goldbard, USDAC Chief Policy Wonk. Register Here. The Stamford Art Association has issued a call for submissions for the 38th Annual Faber Birren Color Show. In 1980, Faber Birren, world renowned color consultant, author of 27 books on color, endowed the Faber Birren Color Award of $1,000 for original and creative expression of color. The Faber Birren Color Award Show has grown from a regional exhibit to one of national scope, encouraging artists in all media. This competition is the only artistic event devoted exclusively to the use of color. This year the Stamford Art Association celebrates its 38th year of the Faber Birren National Color Award Show. This year's juror is: Lindsay Ganter, administrator in the Metropolitan Museum of Art’s Leonard A. Lauder Research Center for Modern Art. Prior to joining the Met, she was a researcher at the Grey Art Gallery. While completing her M.A. at NYU’s Institute of Fine Arts, Lindsay wrote her thesis on James Turrell’s Skyspaces. Painting, Mixed Media, Sculpture, Photography, Printmaking, Drawing are the categories in which work will be accepted. Original art in any two-dimensional or three-dimensional media, created in the last 3 years and not exhibited previously in the Faber Birren Show will be accepted. All entries must be submitted electronically. Electronic media, performance art, and installations will NOT be accepted. Entry fee of $35 (+$20.00 for each additional entry). Over $2,500 will be awarded as prizes. Apply here by midnight, Sunday, July 22, 2018. Artist acceptance will be posted on the SAA's website the week of August 13. New Directions is a premier national exhibition of contemporary art, organized and presented by the Barrett Art Center, home of the Dutchess County Art Association. Artists are encouraged to submit works that provide a juxtaposition of traditional styles and cutting-edge practices in all 2D media, sculpture, video, and installation. Now in its 34th year, New Directions brings contemporary art to an atypical venue - the intimate galleries of Barrett Art Center’s 1840s Greek Revival townhouse. Former domestic spaces remodeled as galleries create a visually-compelling setting for contemporary and cutting-edge work. The exhibition is visited and appreciated by art enthusiasts and collectors from the Hudson Valley and surrounding areas, including New York City, New Jersey, Pennsylvania and the New England states. Juror Jennifer Inacio is Assistant Curator at Pérez Art Museum Miami (PAMM), where she has curated the film series Black Audio Film Collective at PAMM (2017); the museum’s first Augmented Reality exhibition Felice Grodin: Invasive Species (2017–18); and Sid Grossman: Photography, Politics, and the Ethical Image (2018). Entry fee of $50 includes up to three images ($5 each additional image, up to 7). Juror’s Prize: $500; Second prize: $250; $100 honorable merit award. Apply here. The Ridgefield Guild of Artists announces the opening for submissions to its 41st Annual Juried Exhibition. This show has become a September tradition for many, drawing artists and viewers from all over the Northeast. Providing an exhibition venue for both established and emerging artists, The Guild invites all regional artists 16 years and older to participate. The juror for this years exhibition is Denise Bibro of Denise Bibro Fine Art, who began exhibiting the work of contemporary artists and artists’ organizations in corporate and alternative spaces in 1980. All entrants are invited to submit up to 3 pieces of original artwork in any medium. Artists submitting Videos/ Motion Media must supply and install their own equipment. Sculpture or 3-D work must be fully assembled with its own secure and stable base; components cannot weigh over 150 lbs. Member Fees are $20 for the first piece, $15 for the second and $15 for the third. Non-member fees are $30 for the first piece, $20 for the second and $20 for the third. Artists may join the Guild during receiving and pay the lower member fees. Three part entry forms will be available to fill out when you bring in your work for receiving. Awards will be given for 1st, 2nd and 3rd Place, along with Honorable Mentions. Full prospectus available here. The Woven Tale Press is an online and print magazine, published ten times a year, showcasing artists and writers from around the globe. The Hamptons Photography Contest is open to film, digital, Polaroid, photo collage, in fact any photographic form. The contest is also open to multimedia entries, as long as the original image is photographic. The first prize is a one-week stay in a spacious, expanded 1909 charming Cape in the legendary Hamptons, NY, destination to artists from around the world, with accommodations for two and full amenities. The juror for the competition is Lauren Shaw, who studied with mary Callahan and Aaron Siskind at RISD. Sh e is now Associate Profesor at Emerson College where she has taught for 36 years. Entry fee is $25 for 3-5 works. Images must be jpegs, 2600 px minimum longest side, 300 dpi. Separate document should contain titles, sizes, mediums, bio and artist statement. Apply and submit here. 14-30 artists in residence at a time and 207 artists were accepted last year. Yaddo welcomes emerging as well as established artists to apply. Artists who qualify for Yaddo residencies are working at the professional level in their fields. An abiding principle at Yaddo is that applications for residency are judged on the quality of the artist's work and professional promise. Yaddo accepts some 200 artists each year. August 1 is the deadline for residencies starting November of the same year through May of the following year. The application fee is $35, plus a fee for media uploads, depending on the discipline, of $5 to $10. Funds exist to provide limited financial aid to artists, based on need. Only individuals who have already been invited for visits may apply for financial assistance. Specific instructions and an application form are included with each letter of invitation. Apply here. Applicants should provide a 10-page writing sample, as well as a CV and statement of purpose detailing what they hope to gain from the residency. Apply here. The New York Foundation for the Arts (NYFA) is pleased to offer an opportunity for artists in all disciplines to participate in its Artist as Entrepreneur Boot Camp program, established in 2010. The one-day program will be offered on August 22, and will take place at the NYFA Office in Brooklyn. The Artist As Entrepreneur Boot Camp offers the fundamental principles of sustainability—and ultimately profitability—in the arts. This includes topics such as strategic planning, finance, and marketing, with additional material drawn from NYFA’s popular textbook, The Profitable Artist (Allworth Press, 2011). The Boot Camp’s structure is a blend of formal lectures and breakout groups. Participants work through a flexible and dynamic “action plan” and a business model canvas, which provide a blueprint for your practice or specific projects. Connect with other artists as you build the business skills essential to supporting your creative career. The Boot Camp meets Wednesday, August 22, 2018, 10am - 4pm at NYFA's offices at 20 Jay Street, Suite 740, Brooklyn (nearest subways are the F Train at York Street and the A/C at High Street). Cost is $100. Register here. ● how to analyze and track your results. Jane Davila is a printmaker, fiber, and mixed-media artist who also has over 25 years of retail and e-commerce experience. She teaches art quilting, surface design, and creative marketing workshops extensively across the US as well as internationally, including in South Korea, Canada, and Australia. Jane has written several bestselling books on surface design and art quilting, and is the managing director of the NEST Arts Factory in Bridgeport. Register Here. seeks a Marketing Manager who, working closely with the Head of Marketing and Communications, Graphic Designer, and Digital Media Coordinator, will contribute to and oversee various aspects of institutional marketing and messaging, especially e-communications and strategic content creation. Furthermore, the Marketing Manager will manage marketing efforts to meet/exceed admissions, store, event registration, and space rental revenue goals and manage Visitor Services’ marketing needs. Reporting to the Head of Marketing and Communications, the Marketing Manager will work closely with the Development Director and Development Associate to develop, implement, and report on a comprehensive marketing plan to meet/exceed annual membership renewal revenue goals, increase membership renewal rates, increase member engagement, and spearhead marketing efforts surrounding revenue driven campaigns, such as the Annual Fund. Responsibilities include: Manage/support membership marketing efforts i.e. eblasts, direct mail, etc. ; work with Visitor Services team and Development department to devise strategies and platforms to promote membership sales, and market member events and programs; identify and regularly update in-Museum marketing materials that relate to Visitor Services and Development; supervise social media messaging relating to membership, Development, and Visitor Services’ goals and promotional needs; write persuasive letters, articles, and brochure copy for both solicitations and more informational communications about benefits, events, etc. ; manage the communication of member benefits and inspire members to visit the Museum more often and to take advantage of their membership; regularly assess the effectiveness of marketing strategies; create all eblasts relating to Development and membership – content, design, scheduling, and subject lines;' and more. Require-ments: 5+ years of marketing and manage-ment experience in an arts environment; strong writing and inter-personal skills; professional, friendly demeanor; experience working collaborat-ively across departments/ work groups to achieve overall institutional goals; and more. Full description here. Please send cover letter and resume to: jobs@aldrichart.org, with the subject line “Marketing Manager.” Qualified candidates will be contacted. No phone calls, please. The Norwalk Youth Symphony is seeking a conductor for the Philharmonia Orchestral Winds beginning in mid-September (students audition late August-early September). The conductor will be responsible for selecting repertoire for the ensemble, leading Sunday afternoon rehearsals, and leading the wind ensemble’s three annual concerts. Philharmonia Orchestral Winds is designed to develop and enhance the musical skills of outstanding young woodwind, brass, and percussion players. In Philharmonia Orchestral Winds, young woodwind, brass, and percussion players receive the special attention needed to develop their technique, tone, musicality, and orchestral ensemble playing. The group performs orchestral arrangements for wind ensemble, and joins with the Philharmonia String Orchestra at selected concerts during the season to give its members experience in playing literature for full orchestra. In addition to giving students the chance to play in an ensemble, this group also prepares young players to join the wind section of a full orchestra. Preference will be given to applicants who have a bachelor’s degree or higher in music education or performance. Ability to communicate with young people, primarily grades 4-9, is essential. Salary is competitive, and commensurate with experience. Norwalk Youth Symphony, founded in 1956, is a non-profit organization with the mission to inspire and enrich the lives of young people through music. NYS is located in Fairfield County, in southwestern Connecticut, one hour from New York City. For information on the Norwalk Youth Symphony, click here. Please send an expression of interest and résumé, as well as other materials that seem relevant, as soon as possible, to the search committee by email here, or by mail to Search Committee, Norwalk Youth Symphony 71 East Avenue Suite N, Norwalk, CT 06851-4903. Links to short audio or video clips of rehearsals or performances are appreciated. For questions regarding our program or the conducting position call Executive Director, Sara Watkins, at 203-866-4100.